These homemade cinnamon stick trees are an easy, yet satisfying, craft to do with your children as Christmas draws near; it would also make a good group project for the classroom or youth group. The lovely smell of cinnamon is a bonus! Cut the fabric into long strips, about 3/4″ (or 1.5cm) wide. Cut the strips into different lengths starting at around 8 inches (20cm) and gradually getting longer, with the last one being about 12 inches (30.5cm) long. You will need approximately ten to 15 strips per tree. The exact amount needed will depend on the length of the cinnamon sticks that you are using as the Christmas tree trunk, and how full you want the decoration to look. Set down the cinnamon stick and tie the shortest fabric strip near the top. Use a simple overhand knot that is centered on the fabric so that the ends that stick out on either side are fairly even. If you wish, you can reinforce the placement with a small dab of glue, although this is not usually needed. Tie the next longest fabric strip just below the first one. Gently slide it upwards to close the gap. Continue tying strips like this, gradually moving down the cinnamon stick. The last fabric piece should be about one inch from the bottom. At this point, straighten up all the fabric strips and trim them with scissors, if necessary, to get a triangular Christmas tree shape. Tie a loop of thin ribbon, thread or clear fish line to the top of the cinnamon stick to hang your ornament. If desired, decorate your tree with small embellishments, such as seed pods, seasonal confetti shapes, tiny beads, Christmas scrapbook charms or similar decorative elements. 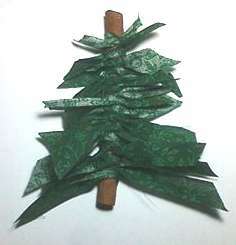 Extracted from the Creative Commons craft project How to Make Cinnamon Stick Trees on WikiHow.com.